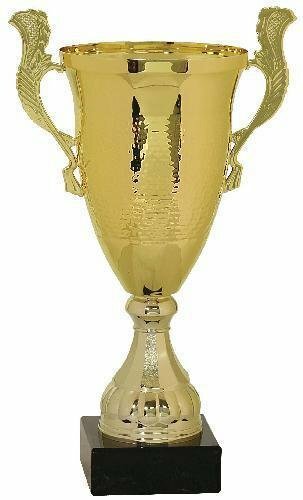 From athletic achievement to corporate awards, this traditional metal cup is the ultimate in recognition. Stately and elegant, the cup is a highly polished gold finish with a ripple design embossed all around. Mounted to a black genuine marble base with room to personalize, it's a beautiful piece anyone would be proud to receive and display. The timeless beauty of the classic cup trophy never goes out of style. This cup is made of steel with a highly polished gold finish and has a design embossed into the surface. Mounted to a black genuine marble base with room to personalize, it's a trophy with an elegant traditional look. This magnificent metal cup is mounted on a beautiful rosewood piano finish base. The cup is available in multiple sizes in both gold and silver. The base has ample room for your personalization to recognize the ultimate achievements of excellence. 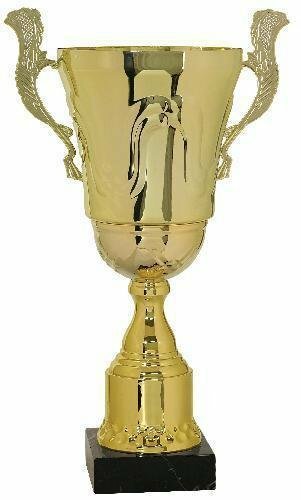 This beautiful gold metal trophy cup has a silver stem for color contrast and is attached to a black plastic cup base. Add a personalized plate to the base for a classic award design suitable for any event. 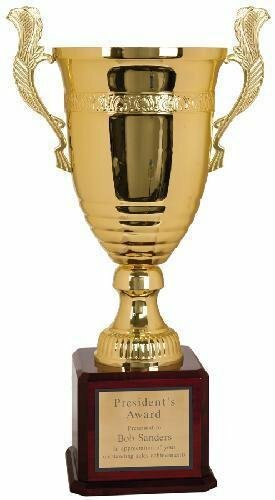 This plastic cup features the classic design of the traditional cup trophy award at a budget friendly price. The cup is in a high gloss gold finish, enhanced by ornate polished silver handles. Mounted to a weighted black plastic base, this is a beautiful way to recognize achievement.